The Inkey List Retinol serum helps to promote skin renewal and enhance the production of collagen. Retinol, a derivative of vitamin A, can help to repair skin damage caused by the natural environment. It actively works to repair and protect against common skin concerns such as fine lines , wrinkles, uneven skin tone and pigmentation issues. As Retinol can often cause irritation due to its strength we recommend that you should initially only use this product every second or third day and gradually build it up. You can also dilute it by mixing it with your regular night cream or serum. It should be applied at night as part of your normal skincare routine. It is important that you always wear an SPF during the day while using Retinol. • Slow release formula for low irritation and effective active delivery. Use in the PM after cleansing and toning and before other serums. Apply a pea sized amount to the fingers and gently tap into the skin. Avoid the immediate eye area. May increase sun sensitivity, always use a broad-spectrum sunscreen during the day. 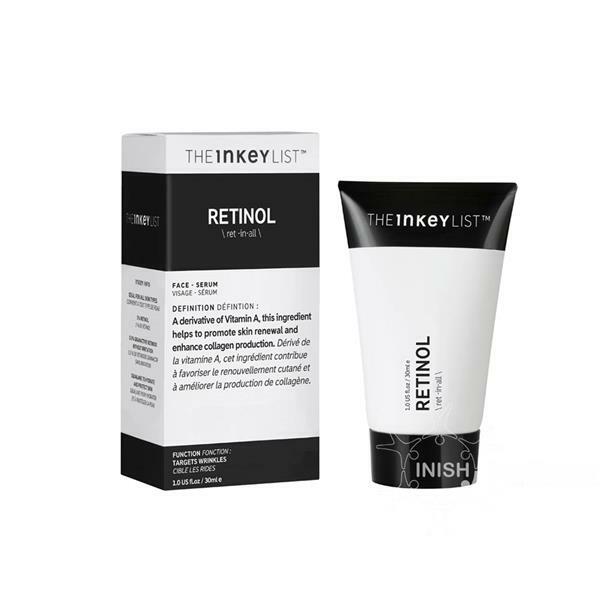 Whilst THE INKEY LIST Retinol has a low irritation formula, for some people redness and flakiness may occur at the beginning of use due to the increase in cell turnover. When first introducing Retinol, you may wish to use a few times per week and gradually increase to every evening. Vitamin C - we do not recommend using Retinol and Vitamin C at the same time. It is best to use Retinol in the PM, so if using a Vitamin C, we would recommend using this in the AM as it has antioxidant properties this is when you will get the most out of the product. AHA's (Glycolic, Alpha Hydroxy, Lactic Acid) - if you are also using an AHA product in your evening routine and want to add a Retinol we suggest using building up to using your Retinol nightly and acids weekly or if you want to use your acid more regularly, alternating with Retinol. If you do wish to use both on the same day, due to PH levels we would recommend waiting around 20 minutes before applying your Retinol and be careful of overuse as both increase skin renewal and may cause sensitivity.